The idea originates from my first visit to China in 2002. Whilst working with the photo material I reflected on study days in Oslo and a visit to the Arts and Craft Museum, seeing old Norwegian cushion covers with cloud patterns (skybragd). 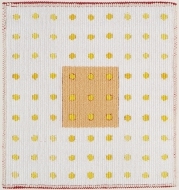 This was a type of design used in traditional Norwegian tapestry weaving, based on the pomegranate-and-palmetto motif. In ”From pomegranate to cloud pattern,” written by Ernst Fischer, he describes the journey of the cloud pattern from the Orient to Scandinavia. Inspiration for my work comes from watching kids paint, how they intuitively and naturally compose pictures. Imagination leads colours, lines, shapes and sizes into interesting and often beautiful content. Scribbling activates mind and emotions, scribblers are decision makers. My work is based on one of the children’s pictures, painted in an open-air workshop. 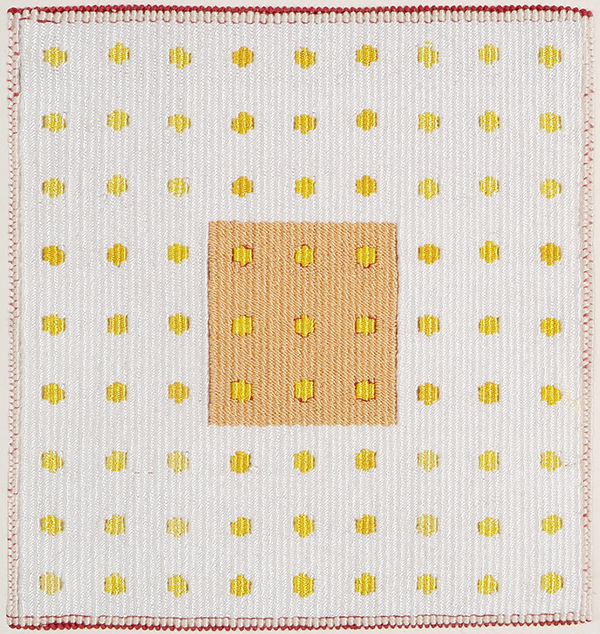 This tapestry is taken from an ongoing series of small drawings that obsessively investigate and explore reduction, refinement and form. There is a quiet presence. There is an unspoken response to landscape that has its roots firmly in a sense of place, in particular and specifically Scottish. “TATOUAGE II” is designed over a simple, minimal sign, a Dot. The theme is body-art from the African continent. Human beings have always liked to decorate the body, with paint, tatoos, jewellery or textiles. African scarification, or tatouage, made as spots or lines, is fascinating to me, and is well-known from Kuba tribal traditions. These dots, used in my recent works, these simple signs, in mixtures of colours, form a string of pearls and indicate contours, similar to oriental designs, creating overall a minimalistic expression. The goal of my recent projects is to restore the organising function of tapestry in a space, while preserving its artistic autonomy. 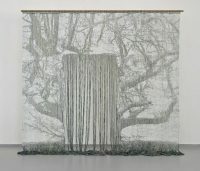 To create and search for unique relationship between tapestry, the wall and space, with the aid of technical means, such as LED lighting and light-conducting fiber. 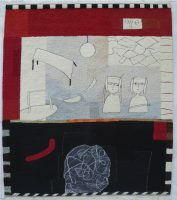 To achieve full expression I use the woven forms of expressive silhouettes while their holes, cracks, slits show the viewer what is behind them. I vary the shape of the outer contour to connect the object with its background…. “My Japanese Diary” was made after a study trip to Japan in 2009. Instead of writing a diary, I found it more interesting to use the inspiration for weaving! 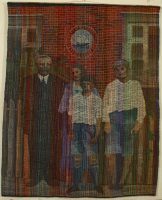 In Copenhagen, the capital of Denmark, every fourth adult lives alone, but still the Zen image of “the happy family” comes to the fore every so often.This tapestry sequence might as well have been called “the Many Headed Monster”. Taken one by one the fragments seem so peaceful, but when they are put together they might tell a very different story. My works express my interest in the track left by history; the energy, the light and its magic, the vibration of the material and its run-up towards complexity. The constitution of the mineral, vegetable, animal, and finally human kingdoms. ….I weave my pictures and stories on a black warp. I often refer to the life and creatures in the beech woods of my childhood in Sweden. 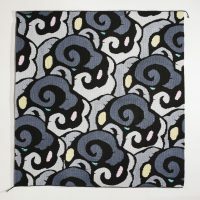 My tapestries grow with colours in wool, linen and cotton. I combine Gobelin technique with a very free use of the old “rosengang” technique. It gives structure to colours and shapes. I want to hand over a piece of family history, that was created before my time, and pass it down to future generations. Historical photos of relatives, translated into my textile language, tell a story of the past to my grandchildren and their children. Arne was newly confirmed and got his first berth on the sailing vessel “Sif” from Marstal. It was during the last days of sail and he returned home after 3 years to study navigation. Johannes, his elder brother, had disabilities and had to stay home. 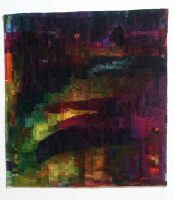 This tapestry is the third in a series of work based on the theme, “standing in the darkness surrounded by the light”, but in this one more emphasis has been placed on the interior square now representing a starry sky rather than a darker space with at brighter golden edge. 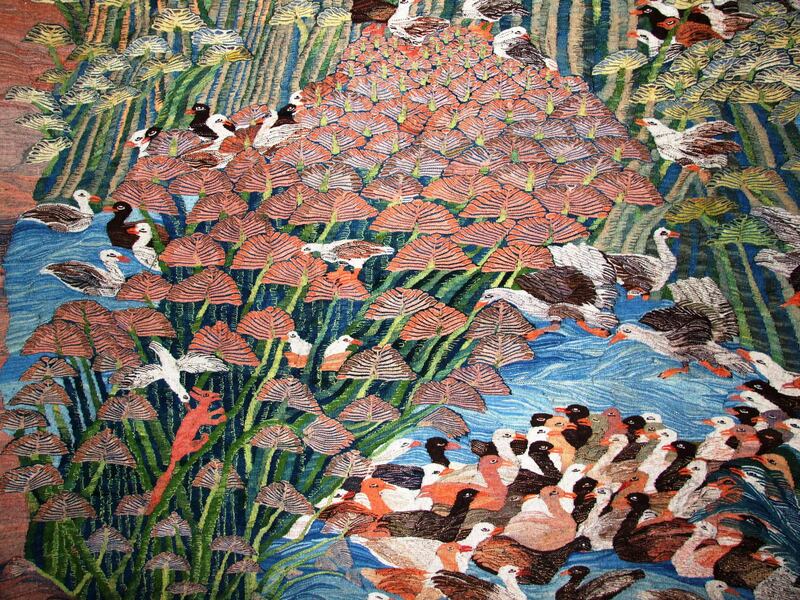 The ideas for the tapestries I get from nature; heaven and ocean, the temperature of air, light and darkness of the seasons and the hours of day and night. After many years in the Universe I came back to Earth at last. I now use my own photos of every-day-situations, accidental and out of focus, as designs. The resulting tapestries look, as I hope, somehow mysterious and ambiguous. 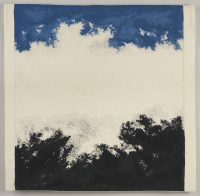 The image was initially taken from a simple line of charcoal down textured paper. 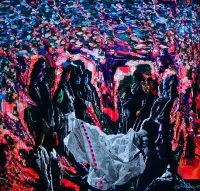 This work, like all my images, deals with the hidden and the ambiguous. 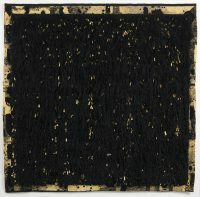 There are symbols and lines in the black weaving, visible only in the right light. 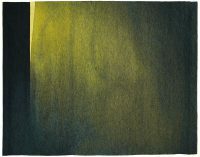 It reads right to left, the white downwards stripe sometimes floats on the surface and sometimes recedes into the background, constantly catching the viewer off balance. 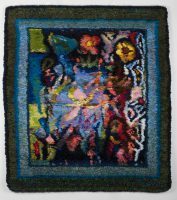 In this tapestry (one of a series of three, “I grow”, “I bend” and “I stretch”) I handle the difficulties in growing as a human being and the challenge of finding my own way and my place in the world. My youth wasn’t easy. 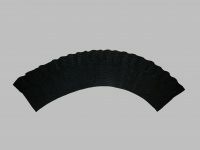 To reach a happy life seemed impossible, and to succeed you should “stretch” and “bend”. In the composition you can see the influence from my trip to Japan: stone gardens were beautiful, peaceful and the most harmonious places I have ever visited. The artwork “Movement Amplitude” is woven delicately, as if it were a thin, almost transparent and barely existing cloth, drifted with time. 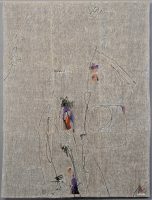 The tapestry is deliberately composed of just a few woven fragments, made in varied directions. However, the woven line of the image goes freely through all the linkings. There are no barriers around. Borders don’t exist. Tapestry is inspired by everyday life, mainly by maintaining the house. The first impulse was buying a new vacuum cleaner, which I favoured and wanted to involve in the composition. I tried to form the usual housework with perspective and humour. I like ordinary things, which are useful and aesthetically supportive as well. Tapestry = Time = Healing. 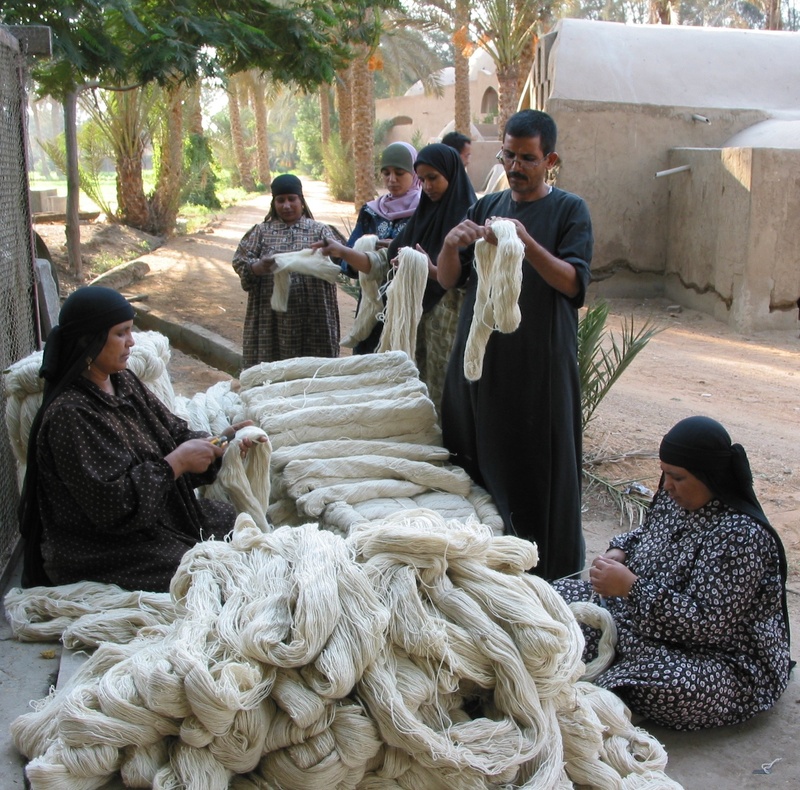 A length of yarn has two ends: a beginning and an ending. For some time now I have been preoccupied with dry landscapes …. 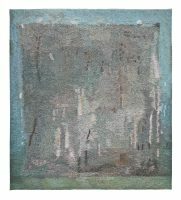 “Straws and Scrubs” is about the arid landscape of the high mountains, which has a materiality to it that is textural, tactile and sensory, with grass and straws, scrubs, stone, earth, light and sporadic intensely – colourful vegetation ….The tapestry moves from an abstract approach to the landscape to a more narrative and figurative approach. I operate with painstakingly thought-through displacements in the visual field. The classic game of what is foreground or background is interesting. My compositions are based on a limited number of lines and form elements. 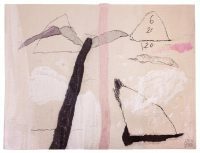 The textile structure is an important element in my compositions as such. I use sisal, which I dye myself. This material is both coarse and strong, and makes it possible to achieve the clear cut lines and forms that are so essential to my compositions. “Le colosse transi” is the third part of a triptych, coming after “Fighting for all eternity” and “The land of the mist.” Mummies, ghosts and now corpses: I weave connections between the world of the living and the world of the dead. How can we possibly catch the missing one in the net of weaving? Maybe by representing his double in a statue of threads, as the Cyrena the ancient Greeks, in a ritual act, represented it in stone. The tapestry “DEPENDS IN WHOSE EYES” is about your way and mine. Situations of life we experience so differently, how we are not able to fully sense someone else’s perspective. 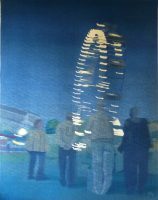 In all my tapestries my aim is to give a serious, reflective and humorous description of human life, behaviours, attitudes and qualities. Light and shadow, their changes, existence and extinction – the never ending dialectics of life and death. When you fly high above the cultivated land and look down, you see fields as coloured squares. Snow, soil, grains, flowers. 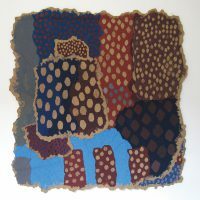 “Lots of Dots” is based on paper collages and is built up in layers. I enjoy patterns that almost repeat, similar to those in nature such as markings on animals. I also use the possibilities of colour and texture to the maximum, by juxtaposing shiny and matte materials, for example, or watery to solid colour. This is a portrait of an ancient oak tree. 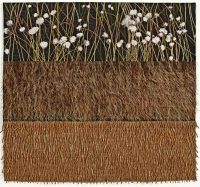 The open space in the wool-warp invites your mind to travel in time, and the winding white nylon-weft tells thousands of stories which have passed by the oak, during its 1000 years standing on the same spot. 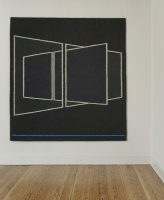 “REAL TIME” was woven in 2010 during an ETF artist’s residency in Skærbæk, Denmark. A form seeks itself in the heat of trembling numbers. What a mountain you are, says heaven, what a palm tree! The tie of love between earth and heaven flows in rose.